After a rather disappointing lunch at the Villa Gresti near Yangjae station, I needed something to satisfy my rumbling and rather grumpy stomach. So as I arrived home at tea-time, I decided to head down to Tartine to check out their rhubarb jam. Chef Garrett left a comment on my Romanian Peasant bread post last night saying that his cafe/bakery was serving his homemade jam and I was in the mood for some sweet baked goodness. 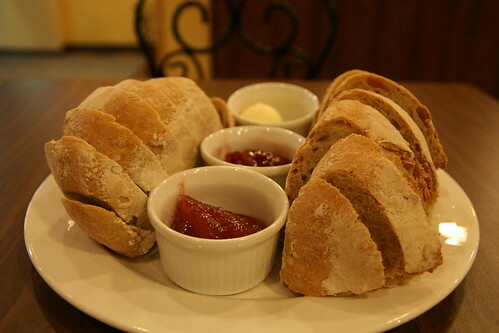 I decided to try the Rolled Oats bread this time for 4,000 won and went for both the rhubarb and the rhubarb and strawberry jams (an extra 500 won). Coffee and tea start from only 3,000 won and Tartine offers a much calmer and more pleasant ambiance than the Starbucks down the road. It feels a little bit like my Grandmother's sitting room, filled with interesting knick-knacks from all over the place, without being too cluttered or cutesy. 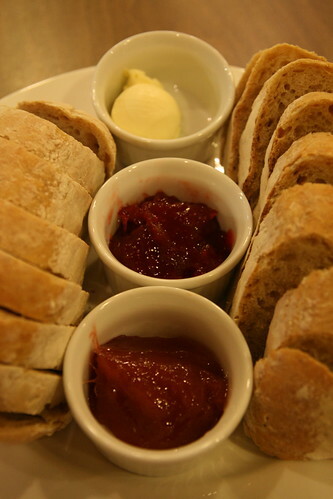 After a few moments preparation the bread, jam and butter came out. Beautifully presented with generous helpings of rhubarb goodness. 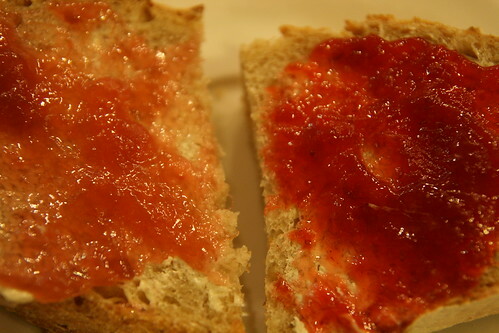 The rhubarb jam was sweet yet tart and worked wonderfully with the bread and butter. The strawberry and rhubarb jam was a vibrant red and to my palate even tastier (but then I've always been a strawberry jam man...). The combinations whisked me back to childhood breakfasts and before I knew it I had scoffed down half the loaf. 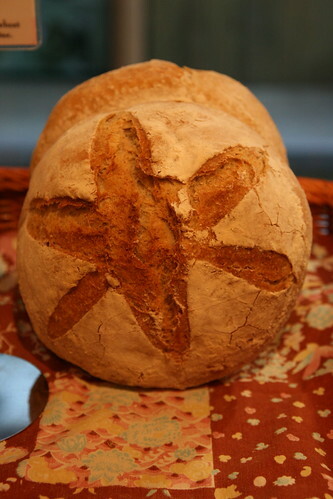 The Rolled Oats bread is my preferred choice over the 5 Grain/3 Seed bread. It is simple, chewy and compliments the butter and jam perfectly. 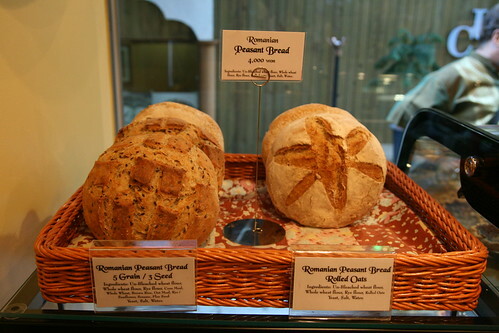 If you are looking for a tea-time snack, then Tartine should be high up on your list. Tartine is two alleys down from the Hamilton Hotel (take the alley opposite the Three Alleys Pub) and serves wonderful tarts as well as Romanian Peasant Bread and scrumptious jam. You can call them on 02 3785-3400 or visit their website here. Yes Sean, that's the place. I hope you get a chance to try it!